Do you need to group the investment prospects you're considering? Would it help to mark those which are potential HMO investments compared to single let's? Or perhaps you're considering multiple geographic areas for your investments and you'd like to be able to group and consider each one separately? You can do all that and much more with PaTMa prospect tags. You can create any number of custom tags. Using then to label and group prospects in anyway you want. When editing a prospect you can use the tags box to select from tags you've used before (they'll auto complete) or enter entirely new tags. Once you've created a tag for a prospect, the tag filter will be visible on your Prospect list. 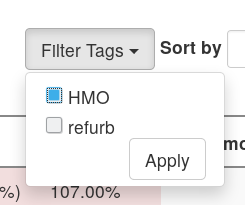 To limit the visible prospects based on tag, open the tag filter menu, tick the tags you'd like included and click filter. Your list will update. Are you still using spreadsheets and paper to track your investment prospects? Upgrade today to a system that provides instant profit calculations, and easy grouping, filtering and sorting to help you analyse your potential investments.